SharePoint- SharePoint was another hot topic of the conference, and many attendees were curious as to how they could leverage automation for their SharePoint processes. We showed them how ActiveBatch can automate the execution of SharePoint tasks such as running backups, copy, creating, deleting or restoring SharePoint objects. ActiveBatch provides SharePoint users with job scheduling capabilities that centrally manage SharePoint jobs and plans, including managing and coordinating complex dependencies and constraints across platforms and systems. In addition to this users can manage event triggers, monitoring, alerts and audits for the automation and execution of SharePoint tasks within workflows that include other applications, databases and processes. Azure- Azure and its role in digital transformation was a topic that attendees were excited about as well because it was highlighted in Nadella’s keynote. We had the opportunity to show attendees exactly how an IT automation solution like ActiveBatch can automate Azure processes. With dozens of advanced, built-in integrations to automate various Azure tasks, including the ability to dynamically manage Azure resources and integrate Azure processes with other cross-platform, cross-application process types, ActiveBatch can reduce operating expenses and improve resource utilization for Azure users. We had an amazing time speaking with all of the attendees at Microsoft Ignite 2016, and can’t wait for Ignite 2017, which is scheduled for September 25-29, 2017 at the Orange County Convention Center in Orlando, Florida! Let us know if you're going to be at Microsoft Ignite 2017, we'd love to meet you there! 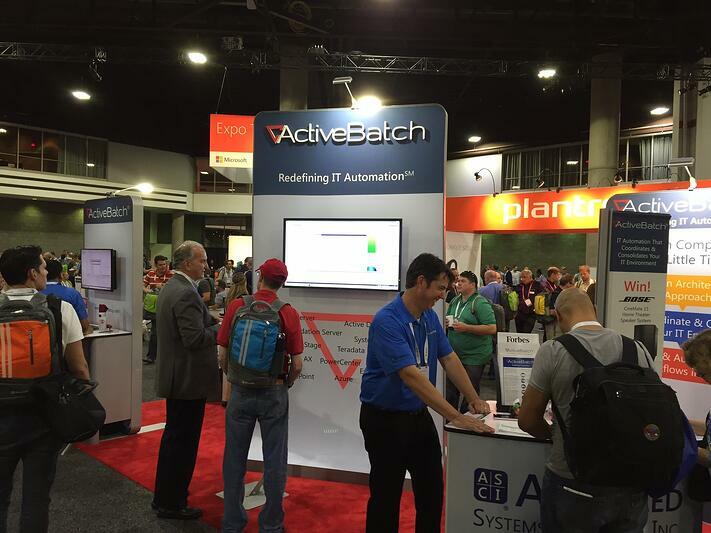 Swing by our booth for an ActiveBatch IT Automation demo and a free ActiveBatch bluetooth speaker.